I know what you’re thinking…Late-summer in December? This is actually a transition season that happens four times a year. In Chinese medicine, the seasons of Late-summer is the last 18 days of each season and is the season associated with the spleen/pancreas and stomach. These organs are also known as the central pivot of health because they start the process of digestion. Proper digestion gives us the fuel we need to get through each day in prime physical, and mental states. If digestion is off, then our system has to figure out how to tap into deeper resources to fuel our daily needs. In this light, it is fitting that the central pivot of health gets four times a year to reboot itself during these four transitional seasons. This year Late-summer goes from December 3rd to the winter solstice. The transition season between autumn and winter is a good time to continue to slow down. Think about what the natural world is doing this time of year. Animals and plants are storing up for the winter, or have already gone into hibernation. It is time to think about creating cozy space at home, to see if we can slow down our routines, to create more time for reflection, and restoration. The theme of this transition season is to move closer to yin cultivation. As with all of the transition seasons, our goal is to eat in a way that supports our digestive system. During this season, our digestive system may give us signs that needs some extra help. Are you experiencing more gas, bloating, acid reflux, or changes in bowel movements? Or perhaps you may feel foggy headed, more easily worried or even anxious? These are all signs that the central pivot of our stomach and spleen/pancreas need some attention. Simple ways to strengthen these elements is to cook all of our food during this autumn to winter transition. That means forgoing salads and switching to sauteed, roasted, steamed, stewed, or stir fried veggies. Poach or bake fruit. Or simmer it to add on top of warm oatmeal in the morning. Use orange squashes and root vegetables to nourish the earth elements, since their color is orange. Spices that naturally support this organ system pair are cinnamon, ginger, cardamom, nutmeg, and clove. Citrus peel in directly helps support these organs by moving stuck energy. 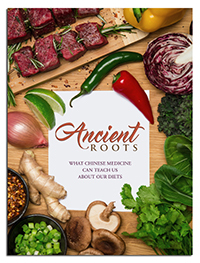 If you would like to learn more about how to specifically using cooking techniques, foods, and culinary herbs to support your health, please check out our Chinese medicine lifestyle and nutrition videos here.